Our Easter Eggs with the Easter Story looking at some of the prophecies that were fulfilled. I got the idea from here. Scroll down on the page and you will see the links to the pictures and verses. I did not use their number 11 egg but added the extra one with the crosses. And then I added the prophecies. So here are the details of prophecy (these I stuck onto the board), NT verse (recording the event as it happened - I glued the two together so that it was written out on one side and where it is found was on the other) and the picture. 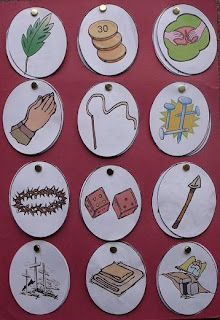 I handed the eggs out to the children (pictures only to those who could not read) and then as we read each prophecy the children had to find the appropriate verse and picture. 1) Zechariah 9:9 "Behold, your king is coming to you; He is just and endowed with salvation, humble, and mounted on a donkey, even on a colt, the foal of a donkey." Mark 11:8 "Many people spread their cloaks on the road, while others spread branches they had cut in the fields"
2) Psalm 41:9 "Even my close friend in whom I trusted, who ate my bread, has lifted his heel against me." AND Zechariah 11:13 "Then the Lord said to me, 'Throw it to the potter, that magnificent price as which I was valued by them.' So I took the thirty shekels of silver and threw them to the potter in the house of the Lord." Matthew 26:14 "Then on of the twelve - the one called Judas Iscariot - went to the chief priests." 3) No prophecy - just recording the events. Mark 14:22 "While they were eating, Jesus took bread, gave thanks and broke it, and gave it to his disciples, saying 'Take it; this is my body.'" 4) No prophecy - just recording the events. Mark 14:32 "They went to a place called Gethsemane, and Jesus said to his disciples, 'Sit here while I pray.'" 5) Isaiah 53:5 "But He was pierced through for our transgressions, He was crushed for our iniquities; the chastening for our well-being fell upon Him, and by His scourging we are healed." Matthew 27:26 "he had Jesus flogged, and handed him over to be crucified." 6) Psalm 22:16 "For dogs have surrounded me; a band of evildoers has encompassed me; they pierced my hands and my feet." John 19:16 "Finally Pilate handed him over to them to be crucified." 7) Psalm 22:7-8 "All who see me sneer at me; they separate with the lip, they wag the head, saying 'Commit yourself to the Lord; let Him deliver him; let Him rescue him, because He delights in him.'" Matthew 27: 39,43 "And those passing by were hurling abuse at Him, wagging their heads... 'He trusts in God; let God rescue him now, if He delights in him; for he said 'I am the Son of God.'" Mark 15:17 "They put a purple robe on him, then twisted together a crown of thorns and set it on him." 8) Psalm 22:18 "They divide my garments among them, and for my clothing they cast lots." 9)Zechariah 12:10 "So that they will look on Me whom they have pierced." Exodus 12:46 "It is to be eaten in the single house; you are not to bring forth any of the flesh outside of the house, nor are you to break any bone of it." (Instructions about the Passover lamb - Christ is the perfect Lamb of God - not one bone broken). Psalm 34:20 "He keeps all his bones, not one of them is broken." 10) Isaiah 53:12 "Therefore, I will allot Him a portion with the great, and He will divide the booty with the strong; because He poured out Himself to death, and was numbered with the transgressors; Yet He Himself bore the sin of many, and interceded for the transgressors." Mark 15:27 "They crucified two robbers with Him, one on His right and one on His left." 11) Isaiah 53:9 "His grave was assigned with wicked men, yet He was with a rich man in His death, because He had done no violence, nor was there any deceit in His mouth." Matthew 27:59-60 "Joseph took the body, wrapped it in a clean linen cloth, and laid it in his new tomb." 12) Matthew 20:18019 "Behold, we are going up to Jerusalem; and the Son of Man will be delivered to the chief priests and scribes, and they will condemn Him to death, and will hand Him over to the Gentiles to mock and scourge and crucify Him, and on the third day He will be raised up." Matthew 28:5-6 "The angle said to the women, 'Do not be afraid, for I know that you are looking for Jesus, who was crucified. He is not here; He has risen, just as He said.'"